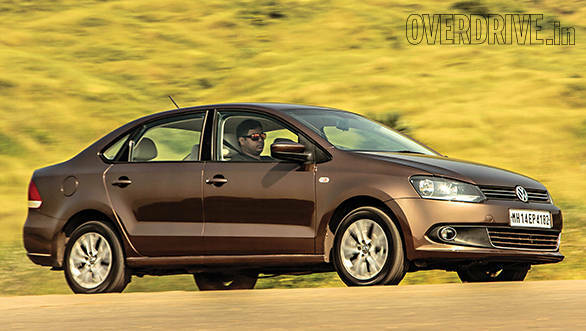 Close on the heels of the launch of the Skoda Rapid comes the 2015 Volkswagen Vento. The new Vento features new petrol and diesel engines and also an automatic transmission for both fuels. We got our hands on the diesel automatic Comfortline version. First, the visual changes in the package. 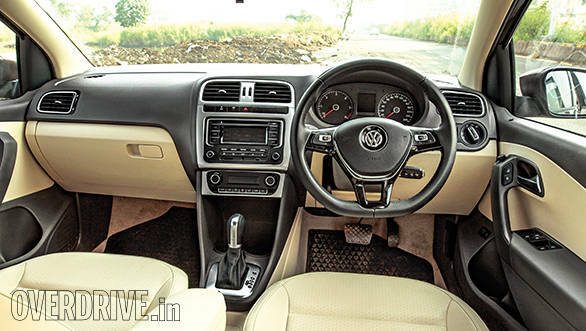 The front end receives a minor facelift with changes that are quite similar to those in the new Polo. The headlamps feature a dual beam design with a blacked out custom look. There have also been some minor changes to the rear bumper, side mirrors and door handles. There are more changes when you step inside the cabin with a new dash layout straight from the new Polo. The colour scheme has changed from a black and beige to a classier brown and beige while the central console gets a chrome accent surrounding it. The new flat bottom, golf inspired steering wheel adds a touch of sportiness to the look as well. It now also features a set of controls on the right hand side that will operate Bluetooth telephony and trip meter functions. The interiors do give one the feel of better quality than it's Japanese rivals though it misses out on features like touchscreen entertainment and a navigation system. It also misses cruise control that it's sibling rival the new Rapid features. 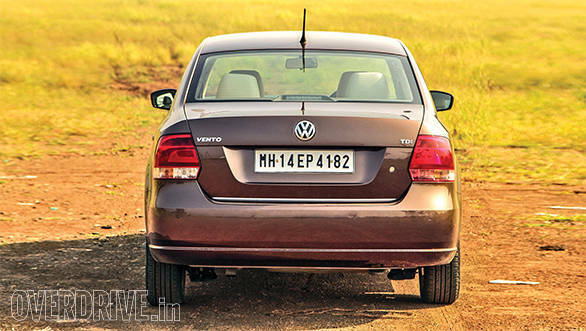 Overall the changes are subtle though they do the job of freshening up the Vento package. The Vento now also features the new 1.5-litre common rail turbo-diesel that we've also seen in the Polo and the new Skoda Rapid. The Vento receives the higher state of tune as in the GT TDI and the Rapid and so, makes 105PS of power at 4,400rpm and 250Nm of torque between 1,500-2,500rpm. It's a refined mill that pulls cleanly from low down in the rev range and makes for quick progress on the open road. While it's not the most powerful engine in this segment, the drop in displacement has not short changed the car. The engine is mated to either a 5-speed manual or a 7-speed dual clutch automatic transmission. And now both this and the Rapid are the only diesel automatic transmissions in the segment. The 7-speed automatic is the same transmission from the Polo GT TSI . It's a very smooth quick shifting gearbox and it features three driving modes - a regular D mode, S for Sport and a manual Tip tonic mode. In drive the shifts are quick and seamless allowing for smooth progress in regular conditions at part throttle but kick-down is a little slow when you prod on the pedal. In Sport mode the transmission holds gear at part throttle and will shift at redline when accelerating through the gears. The manual mode allows you to chose shift points and also holds a gear only shifting at redline or to prevent the engine from stalling. The Vento getting a dual clutch system and not a torque converter means that you should see great efficiency and in our tests, the Vento returned a respectable 21.4kmpl and 13.6kmpl in our highway and city runs. In our performance runs the automatic is just quicker than the old diesel car at 11.49s but we feel that this narrow margin is down to the automatic not allowing you to launch the car with high revs. With a manual transmission it could be faster still. The ride quality and handling are much the same as the old car and that's not surprising, considering that nothing's changed in this department. The ride quality is on the firm side though it's still really comfortable and the Vento always feels more composed compared to something like the City or the Ciaz. It only gets a little crashy over large sharp undulations in the road surface. Handling is good with great high speed stability and a planted feel around corners. The new electronic steering is well weighted at city and highway speeds but does lack quite a bit of feel, though it's still miles ahead of most of the competition. 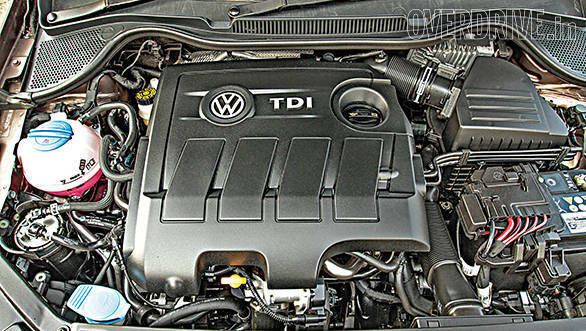 Volkswagen has made some smart changes to the Vento, freshening up what's not broken (good looks) and adding new flavour under the hood as well in the form of a new diesel engine. At Rs 9.35 and Rs 10.49 lakh for the dual clutch automatic transmission in the petrol and diesel versions, respectively, you are getting some of the best automatic technology at a very competitive price. And this might just be the push the Vento needs to pick up its slacking sales and take the fight to the competition.